Caron Forensics produces a modular, rapid-access gun storage system that can place your defensive arms “at the ready”. 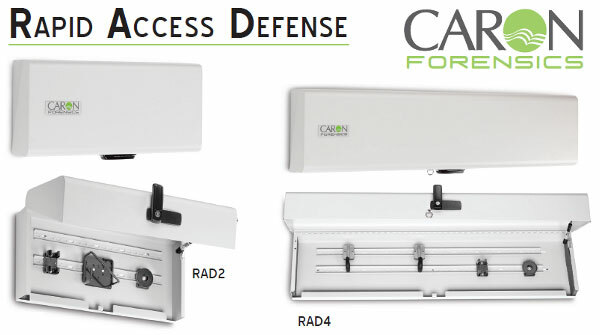 Caron’s RAD (“Rapid Access Defense”) storage units are specifically designed for the fast presentation of defensive weapons in both home and office environments. RAD units come in two sizes: a 2-foot-long model, RAD2, and a 4-foot model, RAD4. They are surface-mounted horizontally or vertically, ideally in a concealed location, such as a bedroom closet, or office store-room. RAD lockers can store defensive weapons safely away from both children and thieves, while still providing gun owners with quick access. Download RAD Gun Locker Descriptive Flyer. Weapon mounts clip to the twin rails inside RAD lockers. Accessories designed to hold weapons (such as the magnetic clip) have a protective plastic or foam coating. There are rubber-coated rifle/shotgun hooks, plus specific mounts for handguns, flash-lights, holsters and other items. RAD cabinets feature a strong key-lock latch to keep unauthorized persons out. A unique gas spring deployment system opens the cabinet with a short pull, enabling the use of both hands to quickly access multiple tactical items. EDITOR’s Comment: Of course, RAD units are NOT designed to replace a large, heavy-walled gun safe to store a collection of firearms and other valuables. RAD units provide only basic security (and fast access) for one or two defensive arms in a home, garage, or office. One nice thing about the RAD2 is you could mount it on a wall with a false conduit and a “High Voltage” sticker. A would-be thief would never think it was a gun locker. Share the post "RAD Fast-Access Modular Gun Lockers from Caron Forensics"